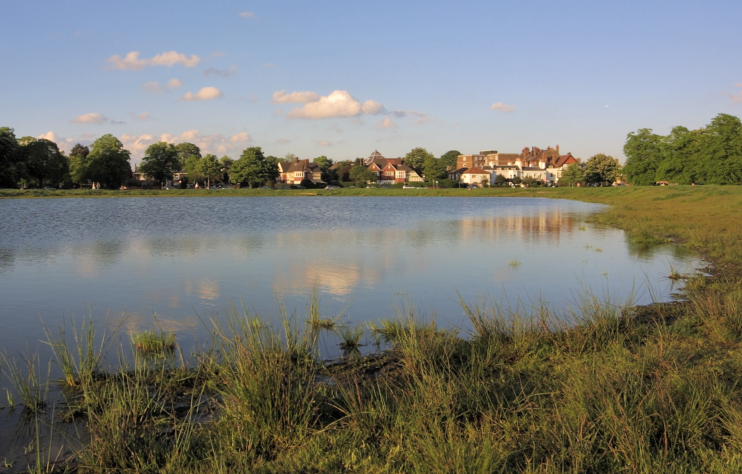 This is London’s largest common, covering 1,200 acres including Putney Heath in the north. Its most ancient feature is Bensbury Camp, popularly though mislead­ingly known as Caesar’s Camp, a hill-fort that probably dates from around the seventh century BC. The common was for centuries part of the manor of Mortlake, owned by the archbishops of Canterbury, with rights of hunting and grazing granted to local tenants. It acquired a reputation as a duelling ground: the politi­cians Pitt the Younger, Castlereagh and Canning were among those who fought here. Earl Spencer gained legal authority to enclose the common in 1803, but backed down in the face of local protests. The best-known landmark on Wimbledon Common is the windmill, built in 1817 to grind corn and now a museum devoted to windmills and woodworking. In a cottage beside the windmill, Robert Baden-Powell began to write Scouting for Boys in 1907. The common has been in public ownership since 1871, but only when the National Rifle Association left for Bisley in 1889 did full freedom of movement become possible. The first golf course was laid out in 1908. In 1948 the council opened Cannizaro Park at the common’s south-eastern corner. This had been the gardens of Warren House, once owned by the Duke of Cannizaro, whose exotic name stuck to the estate even after the house burned down in 1900. The gardens are partic­u­larly admired for their rhodo­den­drons and azaleas. Elizabeth Beresford created the Wombles of Wimbledon Common in 1968 and the environmentally conscious creatures gained their own television series five years later.